Die Stadtreinigung Hamburg (SRH) hat als erster deutscher kommunaler Entsorger damit angefangen, zur Erfassung von allen vier gängigen Abfallfraktionen (Restmüll, Papier, Wertstofftonne, Bio) Unterflursysteme in Zusammenarbeit mit der Wohnungswirtschaft einzusetzen. Auch die Bioabfallunterflursysteme sind bei Beachtung weniger Besonderheiten (Gewichtsbeschränkung, Kondensationsbildung) voll alltagstauglich. Die Akzeptanz der Nutzer und der Wohnungswirtschaft ist hoch, die Qualität des gesammelten Abfalls ist bei akzeptabler Störstoffquote hinsichtlich der Gasausbeute in der Biogasanlage der SRH überdurchschnittlich. Bioabfallunterflursysteme sind damit ein sehr gutes Mittel zur Steigerung der Bioabfallerfassung in verdichteter Wohnbebauung und gleichzeitig ein innovativer Beitrag der Abfallwirtschaft zur Steigerung der Attraktivität des individuellen Wohnumfelds. The city cleaning company of Hamburg (Stadtreinigung Hamburg, SRH) was the first municipal waste management company in Germany to collect all four waste fractions (residual waste, paper, packaging and non-packaging from the same materials and organic waste) via underground systems. The collection of organic waste via underground systems works fine, there are only few particularities to keep in mind. Underground systems are highly accepted by residents as well as the real estate housing companies in Hamburg. 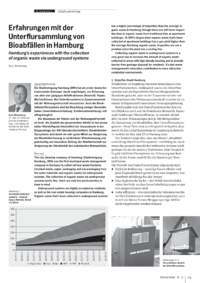 Organic waste thats been collected in underground Systems has a higher percentage of impurities than the average organic waste in Hamburg (though there are still fewer impurities than in organic waste from traditional bins at apartment buildings). At SRHs biogas plant organic waste thats been collected at apartment buildings has a gas yield higher than the average Hamburg organic waste. Impurities are not a problem since the plant has a sorting line. Collecting organic waste in underground systems is a very good way to increase the amount of organic waste collected in areas with high-density housing and to provide barrier-free garbage disposal for residents. Its also waste managements innovative contribution to more attractive residential environments.